I finished this rig last week and it works great. 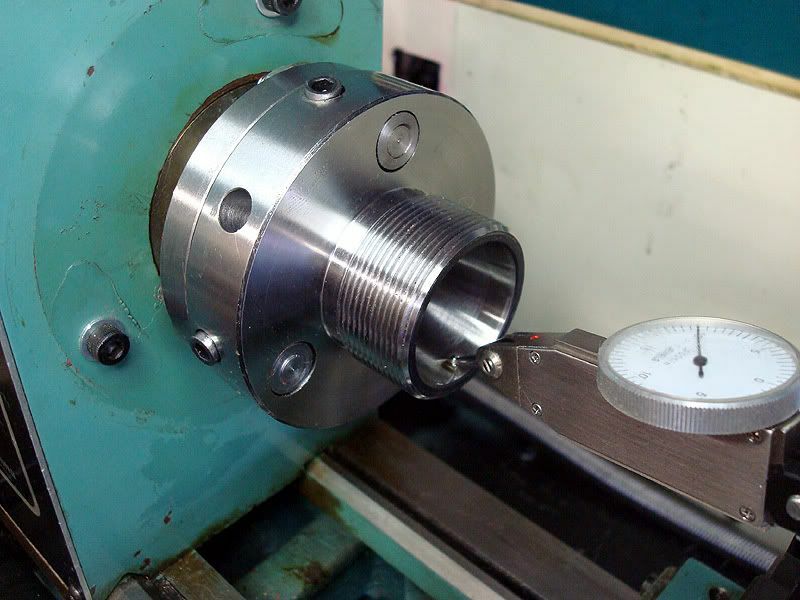 The "set-tru" function comes from the collet chuck's flange bore I.D. being a bit larger than the lathe spindles's nose taper allowing it to be slid around by 4 brass-tipped 10-32 allen screws. 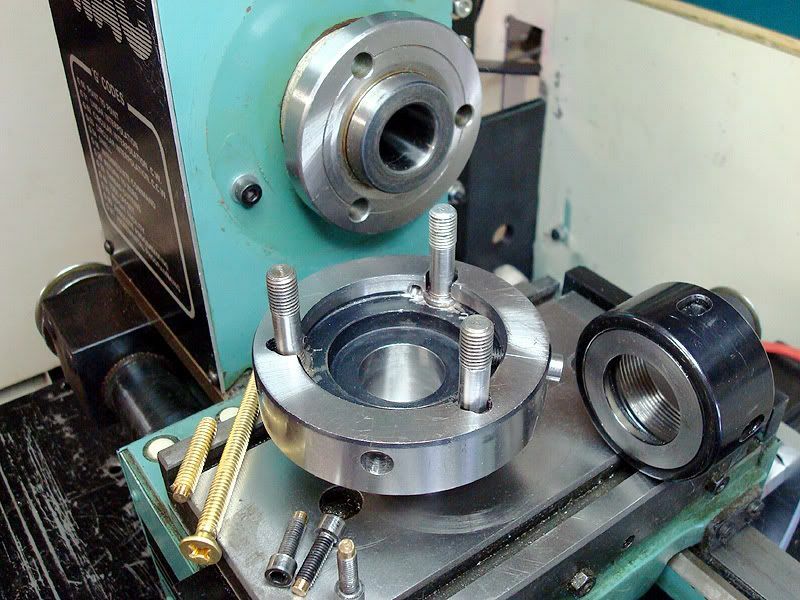 You snug up the chuck flange nuts, dial in a perfect runout then finish tightening the nuts. Works a treat and allows dialing in a collet that happens to be off a little or in my case when repairing existing part features that aren't perfectly concentric. I get a bit of small, fairly close tolerance work that's needs to be chucked in a collet but for whatever reason doesn't run true enough. I used to put an ER chuck in my 4 jaw & that worked OK but the overhang was too much for my taste. The smallest brass I had in the shop for the screws was 1/2" dia. and really didn't want to waste that turning it down to 5/32" so I found some 1/4"-20 brass screws at Home Cheepo @ 2 for a buck & change. Way overpriced but within my budget. The alloy is unknown but machined beautifully and doesn't mar the spindle nose taper. The spindle nose taper is a bit over 7 degrees so I put the chuck in a spin-dexer at that angle in the mill to drill & tap the 10-32 threads to allow the screws a square fit against the taper. I really like how it works other than you have to get used to the adjustments being bass-ackward from a 4-jaw. That lathe has a ISO spindle nose which is very similar to a American "A" type nose. Your right, it works like a inverted 4 jaw. Face runout is going to be what ever it was manufactured to. The way the chuck was "designed" to be mounted was a interference fit between the taper and the vertical face.. IE It touches both surfaces at the same time...touching the taper first and the vertical face last once the bolts are driven home. Should work OK... make sure the bolts are tight! Actually the Emco Compact 8 lathe (which my Denford ORAC CNC lathe is built around) has their own spindle nose, a slightly modified DIN 55021. I've been using the "bump-tru" method of centering the ER chuck for years on my other C8 with no slippage or movement ever seen but yes, I do tighten the nuts up very tight. I don't take huge cuts with it though which probably helps. I added the screws to speed up the adjustment process and make it more consistent. My Prazimat has the same modified DIN 5502 nose, joy! When I first got her I took some time to make up a few backplates to allow me to transfer the 5" chucks across from my old Myford S7B. The Myford chucks have parallel registers so if you fit the chuck and find a bit of run out you can make the register on the backplate slightly smaller, bolt on the new chuck, not too tight and then "tap" the chuck body over until the new chuck runs true then tighten the chuck bolts. Exactly. That's what I'm doing except I use the 4 screws to provide precision taps.